To be found in Menteng, Relish Bistro offers diners dynamic comfort food including Indonesian, pan-Asian and Western dishes designed for sharing, writes Handayani Tanuwijaya. Abundant natural lighting and a high ceiling give Relish Bistro a special ambience. Located at Fraser Residence, Menteng, the 100-seat restaurant serves up plenty of pan-Asian and Western favourites. 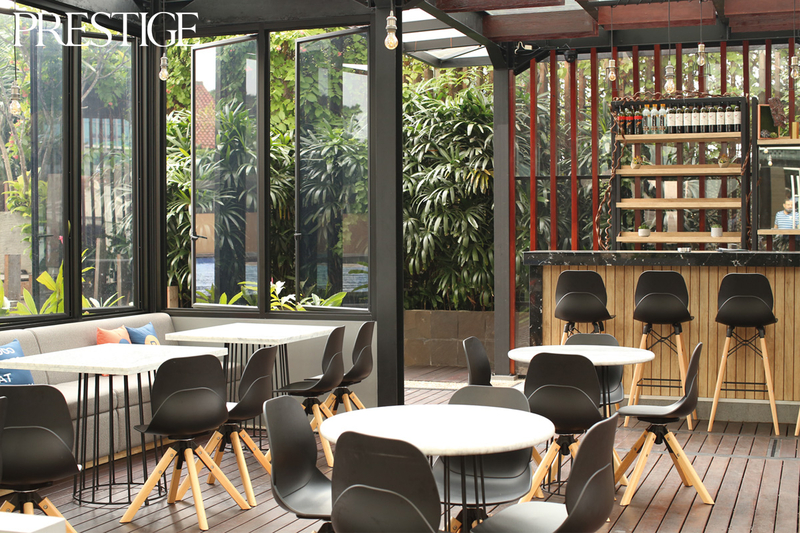 It is early in the afternoon as Prestige takes its table at this casual dining venue. From its floor-to-ceiling windows, we can see a refreshing scene: a blue swimming pool combined with sunny weather. The eatery used to be a restaurant for residential guests only, with a different concept and name. But a few months ago, the owners changed the concept, reimagining both the dishes and the interior design, and inviting the public to enjoy the good vibes it creates. Relish Bistro offers pan-Asian cuisine, but the emphasis is on elevated Indonesian food. There are also some much-loved Western dishes to be savoured, such as pizzas, sandwiches and hearty burgers. The location in Menteng makes Relish Bistro something of a meeting point of cultures, designed to appeal to Indonesians and expats alike. Professionals and government representatives from overseas often come to visit. But also, there are locals who enjoy the good food that can be found here. This is why Relish Bistro comes with pan-Asian cuisine with some Western choices. They’d like to cater to a diverse community of diners. For starters, there’s the house’s detox salad (65,000), which comprises green apple slices, watercress, beetroot, boiled eggs and cheese, all topped off with splashes of apple vinaigrette. This salad gives a sour and refreshing taste to the palate. Among the mains, Aceh gule kacang hijau (140,000) is probably the star. It is inspired by Aceh’s traditional gulai. It is lamp chops served with gule kacang hijau sauce and canai bread. For diners who come with a group of friends, relish pizza (85,000) could be an option. It’s hefty with plenty of slices topped with beef pepperoni, shredded chicken, beef bacon, cheese sauce and melted mozarella. For diners who just want to spend an afternoon chilling by the pool, light bites such as the restaurant’s appetizer sampler (90,000) can be a good choice. Of course, it should be shared with friends or colleagues. Don’t forget to order healthy drinks, such as relish detox (65,000) and the energy booster (55,000). Relish Detox is a mix of apple, horenso spinach and lemon juice. Meanwhile, The Energy Booster comprises watermelon, mint leaves, grenadine and soda. For diners who favour “less healthy” drinks, cocktails such as Jack Sparrow (145,000) and Bahama Mama (125,000) can be good companions for sipping at the outdoor bar beside the pool. There’s always room for dessert, one hopes. The house’s smooth avocado cheesecake (65,000) is served with red bean ice cream and raspberry sauce. Favour something warm yet bitter and sweet? Warm chocolate lava (60,000) could be the answer. Most dishes in the restaurant come in big portions, so bringing along friends and family members could be a good idea when visiting Relish Bistro. This article first published in Prestige August/Power issue 2018. More in the issue and subscribe to prestige, click here.